Dr. Isaya Kisekka, a brand new professor of Hydrology at the University of California, Davis, took time to come down to the longstanding CASI NRI Project field during a tour of San Joaquin Valley sites and visits with people on September 21st. Dr. Kisekka is a recently-appointed professor and agricultural engineer who hails most recently from Kansas State University where he was also a professor. Before that, he received his PhD degree from the University of Florida. At KSU he worked on many of the sorts of things he looks forward to contributing in his new position with UC Davis, namely strategies for sustaining crop production under increasingly water-short conditions. 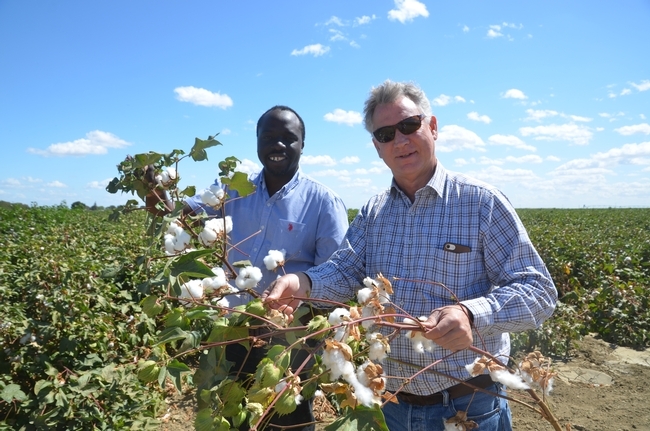 CASI member and veteran UCCE Irrigation, Soils and Cotton Advisor, Dan Munk, coordinated Isaya's tour and took him to many sites of local interest. We look forward to many very productive interactions with Isaya in the future. I had the chance to give Isaya a tour of western and eastern Kern county pistachio and almond orchards using microsprinkler, single and double-line drip on Tuesday 9/19/17 and give him a thumbnail history of the change in crop acreage over the last 40 years from when half the Kern acreage was cotton to the present where the cotton acreage is now < half of the almond and pistachio acreage. Micro irrigation systems in permanent crops are a new area for Isaya. Looking forward to future collaborations. Thank you Dr. Mitchell for the nice blog. Dan and Blake thank you for coordinating my visit to SJV. I enjoyed all the visits and seeing all the great work being done to optimize agricultural water use under limited water resources. I look forward to many fruitful collaborations. UC Merced researchers sample soil hydraulic properties in NRI Project in Five Points, CA, March 15, 2019! CASI hosts Dr. Shannon Cappellazzi of the Soil Health Institute for two days of sampling at the NRI Project field in Five Points, CA! CASI's Munk talks cover crop water use at almond orchard public education event in Merced! CIG's Shrestha conducts cover crop rolling study at Fresno State!